Released quietly at the end of last month as both a download and a (now sold out) cartridge, Sly Dog Studio's NES Virus Cleaner is a great little arcade-puzzle hybrid that is based around the arguably implausible concept of cleaning your NES from a rather nasty virus infection. 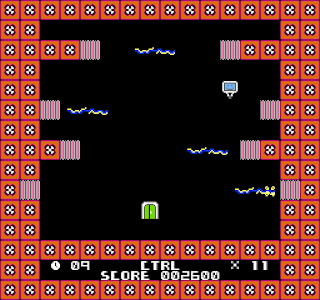 It may look and sound crude (especially now that Blade Buster has recently reset the bar for homebrew quality) but guiding the little virus-killing bot around the various components of the Nintendo Entertainment System proves to be equally fun and challenging. A fair bit of effort has been made to create a genuine feeling of immersion, with your guide Clik introducing himself as soon as you boot the console, warning you of the infection and explaining the rules and controls of the game. 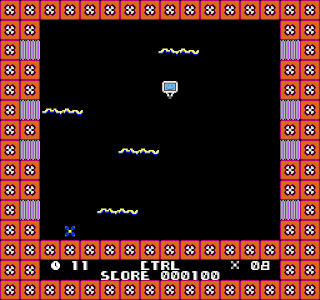 Likewise, each main component of the NES is introduced via a briefing screen that introduces the different enemy types and other dangers you can expect to see on the following levels. 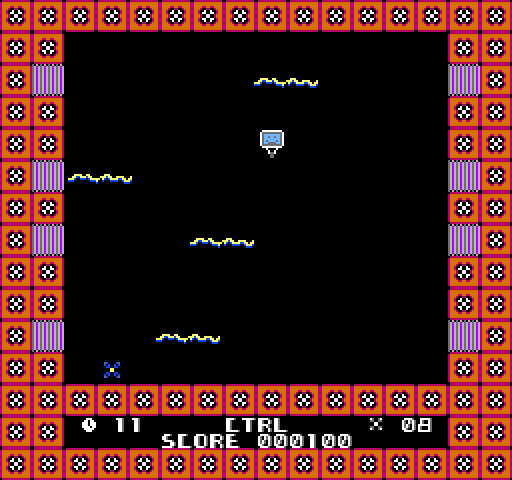 The game-play itself involves moving Click around each single-screen arena, capturing the randomly positioned viruses one at a time against the clock and avoiding hazards. Successfully disposing of a virus awards you with both points and valuable seconds added to the timer, but even with the luxury of additional time on later levels the game can be very challenging. To assist you in your mission you are provided with a teleport device that you can place wherever you want in each level, but using it to warp back to the set location will cost you 1000 points. 1000 points to use what should be considered to be an integral gameplay device? 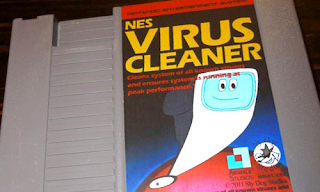 Well, to be frank the design of NES Virus Cleaner is more than a little questionable. Let's look at the rules; 50 points for each virus you capture, OK, but -100 and a life lost for hitting a enemy/hazard? Surely in a timed game like this there is no need for lives - the time lost in dying and score reduction is punishment enough. Also, 1000 points seems a ridiculous price to pay to use the teleport - in my opinion this little contraption is what makes the game differ from so many others and NES Virus Cleaner should have been designed around it's use. As it stands, it feels like an afterthought - you can either ignore the score system altogether and use the teleport whenever you can afford it, or simply ignore the feature itself and aim for a high score. 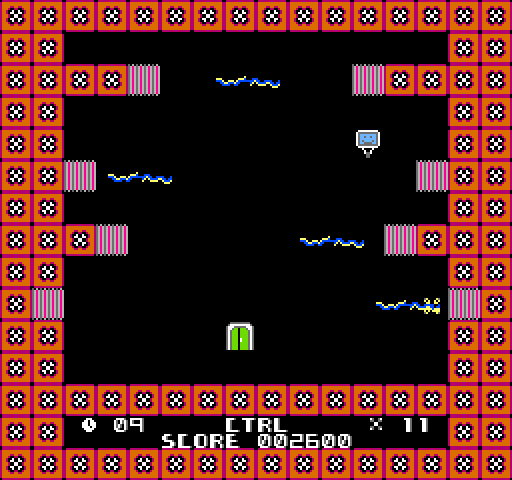 Score punishment on this level does not gel with the game at all; introducing the teleport as a system that either has a limited number of uses on each stage or was powered by a collectable that you could pick up and stack for later use would have been a far more favourable method (in my opinion). 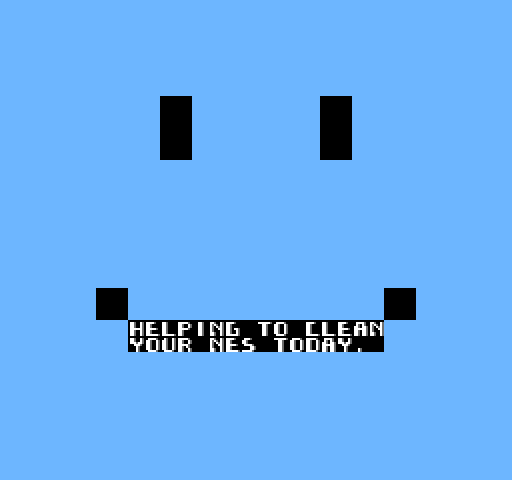 All in all, despite the game's primitive aesthetics and some bizarre design choices, NES Virus Cleaner remains a charming little release with very little to dislike about it. If the cartridges hadn't already sold out then I'd strongly recommend buying one for the kitsch value alone (I love the label artwork! ), but if you're happy using an emulator or are lucky enough to possess a NES flash cart then Sly Dog Studio's latest offering will make a welcome addition to your retro homebrew collection. Download the game here (from the Nintendo Age forum post).